Shaun of the Dead is a 2004 horror comedy film directed by Edgar Wright, co-written by Wright and Simon Pegg, and starring Pegg and Nick Frost. Pegg plays Shaun, a directionless Londoner who is caught in an apocalyptic zombie uprising. The film was a critical and commercial success and was nominated for a BAFTA. It is the first in Wright and Pegg's Three Flavours Cornetto trilogy, followed by 2007's Hot Fuzz and 2013's The World's End. Shaun is a salesman at an electronics store with no direction in his life. His colleagues disrespect him, he does not get along with his stepfather Philip, and after he fails to get dinner reservations and suggests they go to the Winchester, the pub at which they spend most of their evenings, his girlfriend Liz breaks up with him. After the break-up, Shaun drowns his sorrows there with his housemate and best friend Ed. At home, their housemate Pete, complains of a bite wound from a mugger and Shaun and Ed playing electro at four o'clock in the morning whilst he has to fill in at work; he berates Shaun to get his life together. By morning, a zombie apocalypse has overwhelmed London, but Shaun and Ed are slow to notice until they encounter two zombies in their garden and kill them with blows to the head. They form a plan to rescue Shaun's mother, Barbara, and Liz, then wait out the crisis in the Winchester. They escape in Pete's car, and pick up Barbara and Philip, who gets bitten shortly after. They then use Phillip's car to pick up Liz and her friends Dianne and David. Philip makes peace with Shaun before turning into a zombie. The group abandons the vehicle and continues on foot, sneaking through backyards and evading zombies by pretending to be them. They seek refuge inside the Winchester, where Shaun discovers that the Winchester rifle above the bar is functional. Barbara reveals she has been bitten and turns undead after giving Liz and Shaun her blessing. David attempts to shoot Barbara, but Shaun stops him, causing them and the rest of the group to start arguing. Liz is able to stop them, and Shaun, distraught, is forced to shoot Barbara. Zombies break into the pub. David is disemboweled, and an enraged Dianne grabs David's leg and rushes into the horde. The zombified Pete appears and bites Ed, after which Shaun shoots Pete and sets fire to the bar. The fire sets off the rifle ammunition while Shaun, Liz, and Ed flee into the cellar, where they contemplate suicide. Ed volunteers to stay behind with the rifle while Shaun and Liz escape through a hatch that opens to the street. The Army arrives and guns down the remaining zombies. Six months after the outbreak, civilization has returned to normal, and surviving zombies are used as cheap labour and entertainment. Liz has moved in with Shaun, while Shaun keeps the zombie Ed tethered in his shed, where they play video games together. The film is notable for Wright's kinetic directing style, and its references to other movies, television series and video games. In this way, it is similar to the British sitcom Spaced, which both Pegg and Wright worked on in similar roles. The film was inspired by the Spaced episode "Art", written by Pegg (along with his writing partner and co-star Jessica Hynes) and directed by Wright, in which the character of Tim (Pegg), under the influence of amphetamine and the video game Resident Evil 2, hallucinates that he is fighting off a zombie invasion. Having discovered a mutual appreciation for Romero's Dead trilogy, they decided to write their own zombie movie. Spaced was to be a big influence on the making of Shaun of the Dead, as it was directed by Wright in a similar style, and featured many of the same cast and crew in minor and major roles. Nick Frost, who played Mike in Spaced, has a starring role in Shaun of the Dead as Ed. Peter Serafinowicz and Julia Deakin – who played Duane Benzie and Marsha in Spaced – appear in Shaun of the Dead as Pete and Yvonne's mum, and Pegg's Spaced co-star Jessica Hynes plays Yvonne. The film's cast features a number of British comedians, comic actors, and sitcom stars, most prominently from Spaced, Black Books and The Office. Shaun of the Dead also co-stars Dylan Moran, who played Bernard Black in Black Books, Martin Freeman (Tim Canterbury in The Office), Tamsin Greig (Fran in Black Books, Caroline in Green Wing), Julia Deakin (Marsha in Spaced), Reece Shearsmith (Dexter in Spaced and a member of The League of Gentlemen) and Matt Lucas (writer/co-star of Little Britain). In addition, the voices of Mark Gatiss (The League of Gentlemen) and Julia Davis (Nighty Night) can be heard as radio news presenters, as can David Walliams (Little Britain) who provides the voice of an unseen TV reporter. Trisha Goddard also makes a cameo appearance, hosting two fictionalised episodes of her real-life talk show Trisha. Many other comics and comic actors appear in cameos as zombies, including Rob Brydon, Paul Putner, Russell Howard, Pamela Kempthorne (Morticia de'Ath in The Vampires of Bloody Island), Joe Cornish, Antonia Campbell-Hughes (from the Jack Dee sitcom Lead Balloon), Mark Donovan (Black Books) and Michael Smiley (Tyres in Spaced). Coldplay members Chris Martin (who contributed to the soundtrack by guest singing the cover of Buzzcocks' "Everybody's Happy Nowadays" with Ash) and Jonny Buckland also have cameo roles in the film. The film was shot over nine weeks between May and July 2003. The production was filmed in London, on location and at Ealing Studios, and involved production companies Working Title Films and StudioCanal. Many exterior shots were filmed in and around the North London areas of Crouch End, Highgate Finsbury Park and East Finchley. Zombie extras were mainly local residents or fans of Spaced who responded to a casting call organised through a fan website. The scenes filmed in and around the "Winchester Tavern" pub were shot at the "Duke of Albany" pub, 39 Monson Road, New Cross, South London – a three-story Victorian pub. It was turned into flats in 2008. In the United Kingdom, Shaun of the Dead took £1.6 million at 366 cinemas on its opening weekend and netted £6.4 million by mid-May. In its opening weekend in the United States, Shaun of the Dead earned US$3.3 million, taking seventh place at the box office despite a limited release to 607 theatres. The film has earned US$30,039,392 worldwide in box office receipts since its release. Shaun of the Dead received critical acclaim. On Rotten Tomatoes, the film has a score of 92%, based on 201 reviews, with an average rating of 7.8/10. The site's critical consensus reads, "Shaun of the Dead cleverly balances scares and witty satire, making for a bloody good zombie movie with loads of wit". On Metacritic, the film has a score of 76 out of 100, based on 34 critics, indicating "generally favorable reviews". Nev Pierce, reviewing the film for the BBC, called it a "side-splitting, head-smashing, gloriously gory horror comedy" that will "amuse casual viewers and delight genre fans." Peter Bradshaw gave it four stars out of five, saying it "boasts a script crammed with real gags" and is "pacily directed [and] nicely acted." The film was placed sixth in Empire's top one hundred British films list. In 2004, Total Film magazine named Shaun of the Dead the 49th greatest British film of all time. In 2005, it was rated as the third greatest comedy film of all time in a Channel 4 poll. Horror novelist Stephen King described the movie as "...a '10' on the fun meter and destined to be a cult classic." In 2007, Stylus Magazine named it the ninth-greatest zombie film ever made. In 2007, Time named it one of the 25 best horror films, calling the film "spooky, silly and smart-smart-smart" and complimenting its director: "Wright, who'd be a director to watch in any genre, plays world-class games with the camera and the viewer's expectations of what's supposed to happen in a scare film." Bloody Disgusting ranked the film second in their list of the 'Top 20 Horror Films of the Decade', with the article saying "Shaun of the Dead isn't just the best horror-comedy of the decade – it's quite possibly the best horror-comedy ever made." In December 2009, Now deemed Shaun of the Dead the best film of the decade. George A. Romero was so impressed with Pegg and Wright's work that he asked them to appear in cameo roles in the 2005 film Land of the Dead. Pegg and Wright insisted on being zombies rather than the slightly more noticeable roles that were originally offered. Pegg and Frost reprised their roles (animated style) in the Phineas and Ferb Halloween special "Night of the Living Pharmacists" in October 2014. Quentin Tarantino dubbed the film as one of his top twenty films made since 1992. In March 2011, the film was voted by BBC Radio 1 and BBC Radio 1Xtra listeners as their second favourite film of all time. Frank Darabont's The Shawshank Redemption came in first place. The film was released on DVD shortly after its theatrical run in the US, with a DVD release around December 2004 in the US. Features included several audio commentaries, EPK featurettes about the film's production, pre-production video diaries and concept videos, photo galleries, bloopers, and more. The film also saw release on the HD DVD format in July 2007, with a Blu-ray Disc release following in September 2009. 7" Shaun, which was released in Cult Classics series 4. The sculpt was based on the 12" figure. "Winchester" two-pack, featuring 7" versions of Ed and a bloodied-up Shaun with the Winchester rifle. Zombie Ed, which is a re-deco of the "Winchester" Ed, to be released in Cult Classics: Hall of Fame. Upper Deck Entertainment released a card for the popular World of Warcraft TCG in 2007, an ally named "Shawn of the Dead", with the power of bringing back allies from the enemy graveyard. Prominent are many references to George A. Romero's earlier Dead films (Night of the Living Dead, Dawn of the Dead, and Day of the Dead, with Dawn in particular being referenced). The 2010 Cuban film Juan of the Dead and the 2013 Singaporean film Hsien of the Dead were inspired by Shaun of the Dead. The film's score by Pete Woodhead and Daniel Mudford is a pastiche of Italian zombie film soundtracks by artists like Goblin and Fabio Frizzi. It also uses many musical cues from the original Dawn of the Dead that were originally culled by George A. Romero from the De Wolfe production music library. On the soundtrack album, dialogue from the film is embedded within the music tracks. Pegg and Wright also scripted a one-off tie-in comic strip for the British comic magazine 2000AD titled "There's Something About Mary". Set the day before the zombie outbreak, the strip follows and expands on the character of Mary, who appears briefly in the introductory credits, and is the first zombie whom Shaun and Ed are aware of, and details how she became a zombie. It features expanded appearances from many of the minor or background characters who appear in the film. The strip was made available on the DVD release of Shaun, along with two other strips that wrapped up "Plot Holes" in the film, like how Dianne escaped and survived the Winchester incident, and Ed's fate after taking refuge in the pub's basement. In 2005, IDW Publishing released a four-issue adaptation written by Chris Ryall (with input from Edgar Wright & Simon Pegg) and drawn by Zack Howard. The comic also contains scenes that were left out of the movie. ^ "SHAUN OF THE DEAD (15)". British Board of Film Classification. 26 March 2004. Retrieved 4 August 2013. ^ "Shaun of the Dead (2004)". British Film Institute. Retrieved 7 July 2014. ^ Andrew Collins. "Simon Pegg: The World's End is $4 million shy of double what Hot Fuzz cost". RadioTimes. ^ a b c "SOTD at Box Office Mojo". boxofficemojo.com. Retrieved 2 November 2009. ^ Slender Fungus (13 November 2008). "Coldplay Official Site: The Oracle Knows Everything". Coldplay.com. Retrieved 6 March 2012. ^ "SHAUN OF THE DEAD wraps". ^ "EAT MY BRAINS! - Shaun of the Dead on-set photos - Feature Article". ^ Kimberley Dadds. "The "Shaun Of The Dead" Guide To London". BuzzFeed. ^ "SOTD UK figures at Box Office Mojo". boxofficemojo.com. Retrieved 2 November 2009. ^ "Shaun of the Dead (2004)". Rotten Tomatoes. Retrieved 16 April 2007. ^ "Shaun of the Dead". Metacritic.com. Retrieved 16 April 2007. ^ Nev Pierce (7 April 2004). "Shaun of the Dead (2004)". BBC. Retrieved 1 November 2009. ^ Peter Bradshaw (9 April 2004). "Shaun of the Dead". London: The Guardian. Retrieved 1 November 2009. ^ The 100 best British films. Empire (official website). Published 5 September 2016. Last updated 7 September 2016. Retrieved 9 September 2017. ^ "50 Greatest Comedy Films". Channel 4. Retrieved 16 April 2007. ^ ""Shaun of the Dead" DVD News". Rebecca Murray. Retrieved 14 July 2007. ^ "Stylus Magazine's Top 10 Zombie Films of All Time". Stylusmagazine.com. Retrieved 6 March 2012. ^ "Shaun of the Dead, 2004". Time. 29 October 2007. Retrieved 1 November 2009. ^ "00's Retrospect: Bloody Disgusting's Top 20 Films of the Decade...Part 4". Bloody Disgusting. Retrieved 3 January 2010. ^ Norman Wilner. "Top 10 films". NOW. ^ a b J.C. Maçek III (15 June 2012). "The Zombification Family Tree: Legacy of the Living Dead". PopMatters. ^ "Simon Pegg interviews George A Romero". TimeOut. Archived from the original on 29 November 2009. ^ "Shawn of the Dead characters appearing in Phineas and Ferb". IGN. ^ "Tarantino Reveals His Top 20 Movies (Since Reservoir Dogs)". Screen Rant. Retrieved 12 April 2010. ^ "Radio 1 Movies Blog". BBC. Retrieved 6 March 2012. ^ "Vera Drake scoops best film award". BBC. 6 February 2005. ^ "Shawn of the Dead Card Preview". UpperDeck.com. Archived from the original on 16 July 2007. Retrieved 15 July 2007. ^ "Shaun of the Dead Pop Culture References". Shaunofthedead.com. Retrieved 6 March 2012. ^ Defore, John (15 September 2011). "Juan of the Dead (Juan de los Muertos): Toronto Review". The Hollywood Reporter. ^ Robert, Catherine (11 August 2012). "Zombie film cast had a blast". Archived from the original on 1 November 2013. ^ ""Shaun Of The Dead" Comics to Come from IDW Publishing In June". Comic Book Resources. 21 February 2005. Retrieved 3 March 2019. 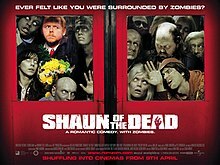 Wikimedia Commons has media related to Shaun of the Dead.